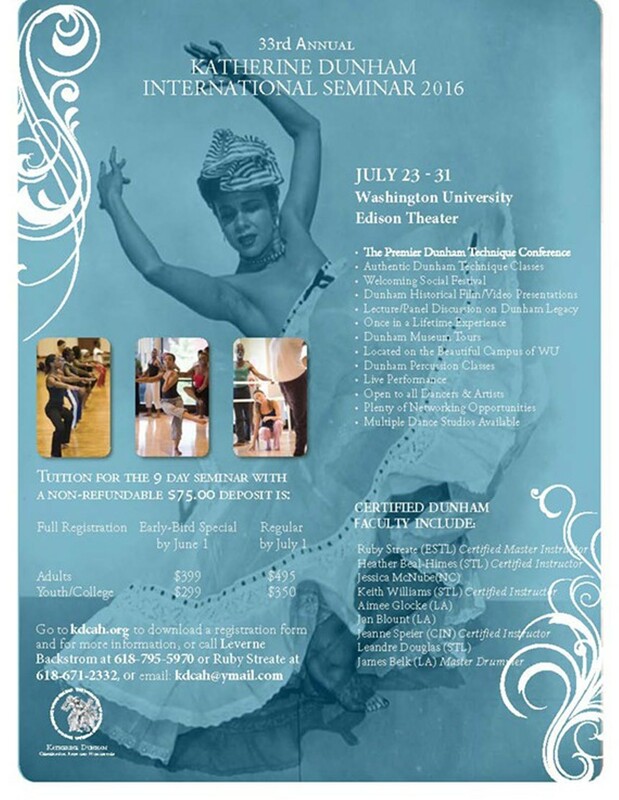 The Katherine Dunham Centers for Arts and Humanities will be hosting the 33rd Annual Katherine Dunham International Seminar 2016. This event will take place on the beautiful Washington University Campus. Tuition for this event is $495 for adults, $350 for youth/college students. The 9 day seminar offers authentic Dunham Technique Classes, Hip Hop, a welcoming Social Festival, film/video presentations, lectures/panel discussions, Museum tour, percussion classes, and a live performance. Multiple dance studios available. Individuals wishing to receive more information can visit www.kdcah.org, email kdcah@ymail.com or call Ms. Leverne Backstrom at (618) 795-5970 or Ms. Ruby Streate at (618) 671-2332.